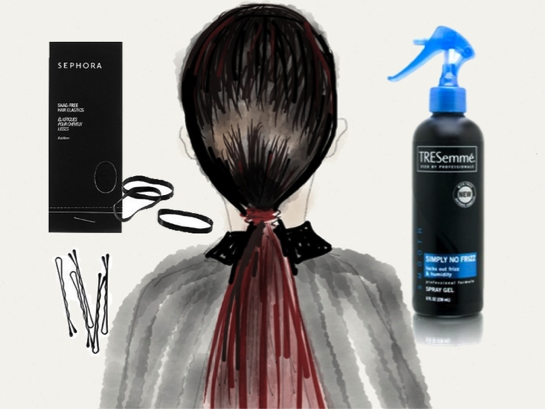 From its purely functional beginnings (keeping a cave women’s hair out of her eyes when working), the humble ponytail has emerged as one of winter’s go-to hair trends thanks in part to its simple sophistication. Having a bad hair day? Don’t give up, just pull it back! The ponytail is this holiday season’s easiest hairstyle and it is only an elastic away. Compliment a sleek minimalist ensemble with an ultra chic slicked back pony. Step 1—Blow dry or flat iron hair away from the face towards the nape of the neck. Step 2—Lightly apply Tresemme Smooth Frizz-Fighting Hair Spray Gel and comb back towards the nape of the neck. Step 3—Secure ponytail with a snag free hair elastic. Step 4—Take a piece of hair and wrap around elastic secure with a bobbi pin under the ponytail. For more impact, add a colored ponytail extension like one I found at H&M. Team a cozy sweater with the nonchalance of a loose, textured ponytail. Step 1—Blow dry hair while working fingers through, to add volume and movement. Step 2—Add texture with Bumble and Bumble Thickening Dryspun Finish spray. Step 3—Create an imperfect middle or side part and loosely pull hair back into a low pony, leaving a few strands out to softly frame the face. 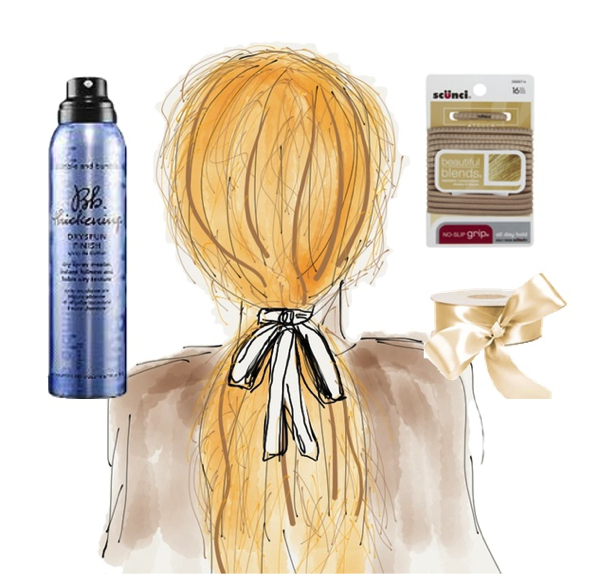 Step 4—Secure ponytail with a non slip holder that matches your hair color topped with a pretty ribbon. Dress up a ponytail with elegant volume. For this one you’ll need a teasing comb! Step 1—Apply Catwalk by TIGI Volume Collection Your Highness Root Boost Spray at the roots and blow dry hair up and away from the scalp. Step 2—Use a teasing brush (I love Phillips 3 Row Teasing Brush) and backcomb hair using a round motion like your beating an egg. Step 3—Side part the hair and gently bring hair back to the nape of the neck. 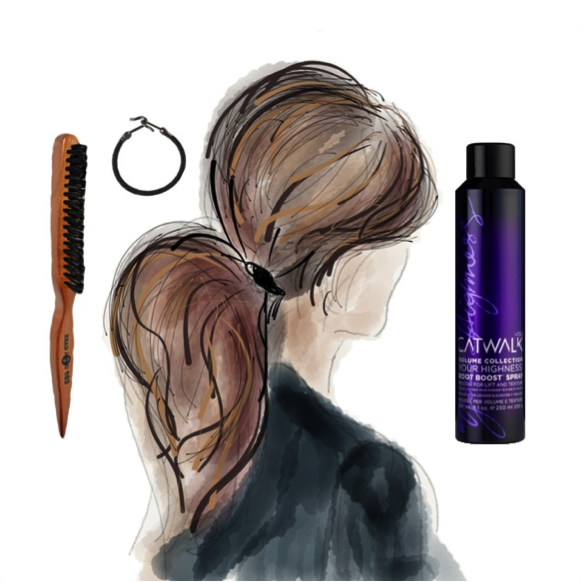 Step 4—Secure ponytail with a hair bungee the same color as hair.